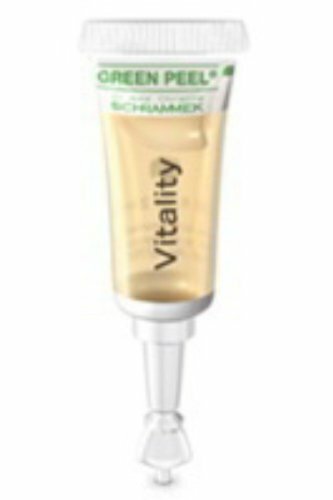 Dr. Christine Schrammek Herbal Active Vitality ampolule - 21 x 2 ml Mature and demanding skin needs special care. The GREEN PEEL® VITAL series was developed for those who are looking for regenerative- oriented skin care on natural basis. Two plants in particular play a central role in VITAL: Organic sea buckthorn and rose hip. The valuable oils extracted from the fruits of these two plants support the natural skin function and renew its tone. Regenerative cream with organic sea buckthorn oil. The rich cream with organic sea buckthorn oil nourishes and protects mature skin and makes it feel smooth and soft. Rose hip seed oil firms and regenerates and, when combined with Aloe Vera, skin looks and feels radiantly smooth and fresh. Regenerates damaged skin. The pure plant ingredients activate the skin's metabolism. Skin looks beautiful, firm and revitalized. For large-pored skin and for blemishes. Using a combination of plant extracts, such as melissa and sage. The skin is cleared and oily areas appear math and balanced again. Two plants in particular play a central role in VITAL: Organic sea buckthorn and rose hip. The valuable oils extracted from the fruits of these two plants support the natural skin function and renew its tone.